The Irish Federation of University Women’s Public Speaking Competition for girls under 15 years of age was held on Saturday 6th February in the Quinn building at U.C.D. Belfield. Maryfield’s entrants were Mairéad Kelly McHugh, Ciara Ní Chuirc, Lorna Lawless and substitute Abbey Byrne. The challenge of this competition for speakers is to draw an unseen aspect of their chosen topic and in thirty minutes prepare an on the spot two to three minute speech. Mairéad, whose topic was School Life, drew the aspect homework is an unnecessary evil. Ciara, whose topic was Health and Lifestyle, drew the aspect drugs affect more than the user. Lorna, whose topic was Family Life and Relationships, drew the aspect do parents know their children? Mairéad, Ciara and Lorna’s excellently articulated and well timed speeches which demonstrated great knowledge, research and humour were rewarded with admirable applause from a captive audience. Six schools took part and after a lengthy deliberation St. Leo’s of Carlow were announced the winners. 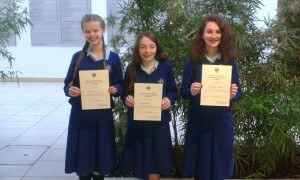 Maryfield can be very proud of a truly great performance by Mairéad, Ciara and Lorna who each received certificates for their achievement. Their commitment to lunchtime rehearsals is to be commended not forgetting the other public speaking enthusiasts Abbey Byrne, Nina Jashi, Emma Tyrrell, Saoirse Dunne, and Sara Gunnigan who no doubt we will be hearing from in the future. On Thursday 25 February the Dublin Brigade Irish Volunteers visited the school with their 1916 Exhibition. Paul, Ronnie and Dermot engaged the students with their stories of those who took part in the Rising and the students were then invited to examine the vast array of memorabilia they had brought with them. It was a great start to our commemorations of the 1916 Rising.